This photo has recently come to the museum. It is captioned ‘First hospital week – 1921’. It shows a wonderfully decorated car in the High Street in Easterton. The Hospital Weeks were always joint events – Market Lavington and Easterton. That looks like a collection box on the side of the car. The car may be too well decorated for recognition. These look like electric headlamps but others may well be acetylene lamps. We’d love to hear from anyone who can add anything more about this image. A few days ago a lovely photo of a watercolour painting popped into our Curator’s in-box. Actually, it wasn’t captioned and Carey, who sent it, wasn’t sure where it was but Russell Mill is well known at the museum and it was recognised immediately. Here is that image. The painting is dated at 1921 but we can’t yet make out the artist’s name. Can anybody help there? What is the artist’s name? Let’s deal with a bit of history. In 1961 Russell Mill was ‘transferred’ from Market Lavington to West Lavington. The picture shows the house from the West Lavington side and we can see a decent level route way leading to it. The track from the mill into Market Lavington is deep, rutted and muddy – not usable by motor vehicles and in the 50s residents spoke of the absurdity of having to go past the West Lavington polling station on their way to vote in Market Lavington. Eventually, the residents won and the parish boundary was altered. On our 1926 electoral roll, close in time to the painting, Ruth and Herbert Draper, William and Mabel Helps, Tom Lye and Thomas and Emily Matthews all lived at properties at Russell Mill. James Topp owned land there and was qualified to vote in Market Lavington. But back now to the nineteenth century. The most famous residents were the Saunders family for whom this was home and also one of many business interests. Amram Saunders, the head of the family, was very active in local affairs and also nationally. 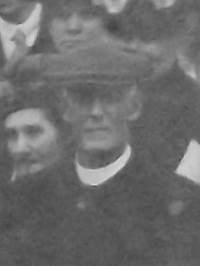 He was non-conformist in religion and very much on side with working people. Amongst his children, raised at the mill, one became a British MP and one a member of the New Zealand Parliament. All of the children were full of radical and reforming zeal. They had quite an impact in the Lavingtons as well as further afield. Many thanks to Carey for sending us this wonderful image. Alf or Alfie or Alfred Davidge was Market Lavington born and bred. He was born in 1894 to parents Edwin and Mary Jane. Mary Jane was a local girl. 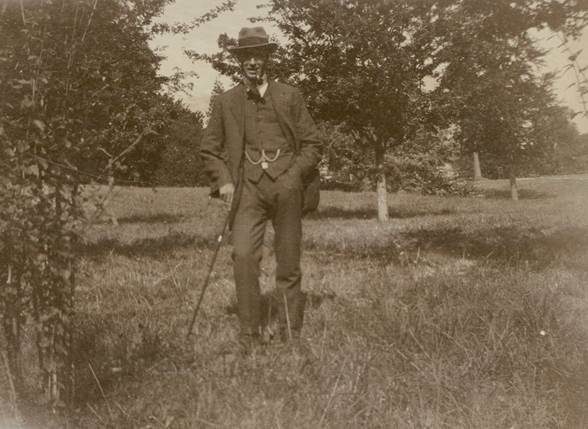 Edwin had come to Market Lavington to work at the brickworks. Edwin and Mary Jane lived at Broadway with a family that increased in size quite rapidly. 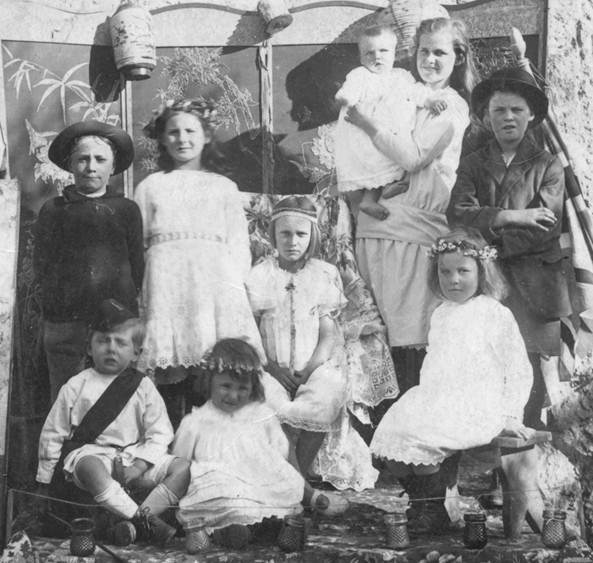 In 1891 they had two children and by 1911 they had had ten offspring of which eight were still alive with six living at home. Amongst them was Alfred, aged 16 who worked as a shop assistant. Alfred’s sister took our photo and captioned the back of it. Now there’s a model for captions. It has who, where and when although if you want to quibble then she should have added the surname. Evidently Alf’s sister was employed at Clyffe Hall by the Warringtons. And here is the photo. Alf is looking very debonair. In fact he would have fitted in well with the picture of Lord Warrington we showed just a few days ago. We believe Alfred was still living with his parents when the 1926 electoral roll was drawn up and then we lose touch with him. His death was recorded in the Devizes district in 1985. We know there are people out there who can tell us more about Alf. Do get in touch. How lovely, to take the youngsters out for a picnic in lovely summer weather. There’s a chance for the youngsters to relax and be social and even enjoy the company of the teacher. Well that is what we think is happening here. We have what look to be a very smartly turned out set of children. They do look to be happy. We have some names although as is often the case, the captioning is not perfect. In the back row from left to right we have: W Cooper, ? 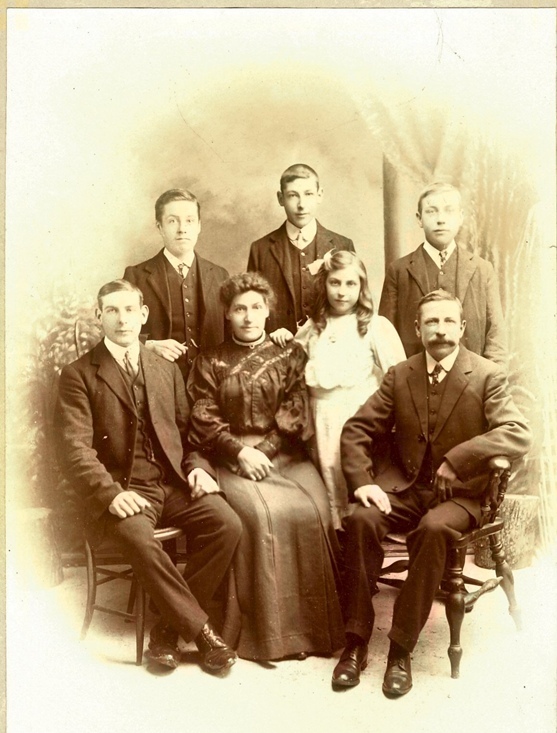 Bullock, D Cooper, E Gye, Not known and May Potter who became Mrs Elisha when she married. Standing in front there is; not known, L Potter, V Tucker not known and B Shepherd. Sitting in front; two not knowns, B Jordan and B Gye. There’s no need to tell us there are more names than people. It’s a long shot but maybe somebody out there can help sort out the muddle. The groom and bride we have met before. Robin (whose name was actually Robert) Burgess was the son of Alf and he took over the photography business, with brother George in 1918. Elizabeth (known as Nellie or Queenie) was a Burnett from Easterton. 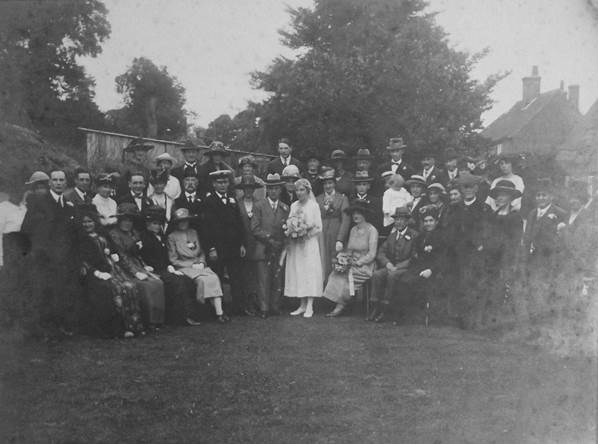 The wedding, in 1921, took place in Easterton. 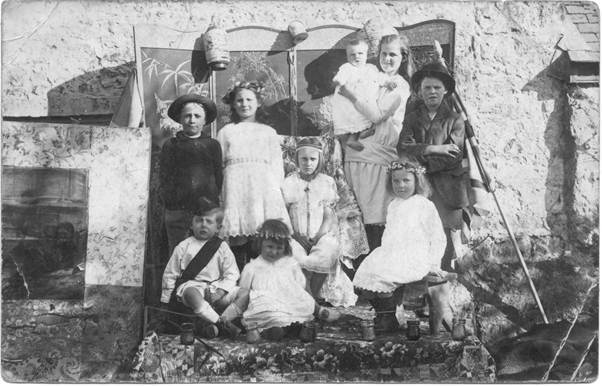 The Reverend King officiated and is one of the guests shown in this photo taken in a cottage garden in Easterton. This is the only picture that we have of Reverend King. His name lives on in ‘Kings Road’ for it was this good chap who managed to get the road surfaced. It was important to him as it linked his vicarage with his church, in one direction and Devizes in the other. It isn’t a wonderful picture. Has anyone out there got a better one? Although Easterton always seems to have had a separate identity from Market Lavington, up until 1874 they were one and the same parish. 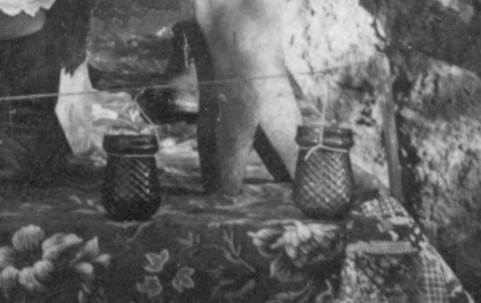 By 1921, when Robert (known as Robin) Burgess married Elizabeth (known as Bessie or Queenie) Burnett, the villages had been separate parishes for over forty years. But of course, they were neighbours and it would be expected that people from one parish would marry partners from the other one. This wedding is a case in point. Here we see the bride, Queenie, in her calf length wedding dress. She appears to be head to toe in white. Robin looks every inch the dapper young man in his smart suit with carnation, his pale tie and jaunty trilby hat. 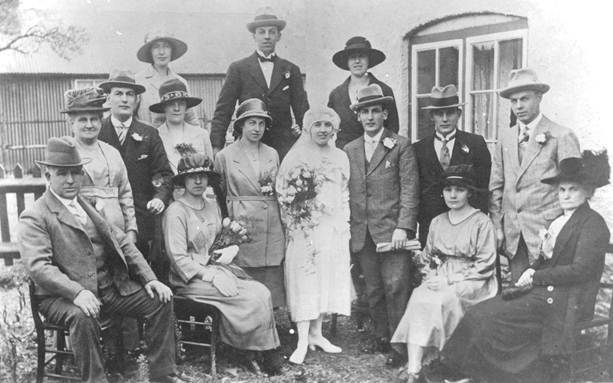 We do not have the names of other people but we are confident that the older lady on the right is Marion Burgess, the widowed mother of the groom. The gentleman third from left and the one next to Robin certainly have the look of Burgesses. Perhaps the older couple on the left are Queenie’s parents, Henry and Beatrice Burnett. Maybe the other two men are Burnetts. A comparison can be made with a Burnett family photo here. We are not sure who the other women are. The year is 1921. Young Ena Gye has written a play to be performed by her friends and family. It is called The Runaway Husband. Perhaps Ena, who was seven at the time, based this on some real life experience. Doting parents took a photo – or arranged for one to be taken. What a charming tableau. Apart from the children – we’ll return to them – take a moment to admire the footlights. The wonderful glass candle holder footlights. I wonder what became of them. Small jars which look to be different colours, hang from a string. They probably contained night lights and would surely have looked very pretty. These are well captioned on the reverse of the card. A well captioned card. We know who all of the children are! So, standing from left to right we have Eric James, Ruth Mundy, Winnie Mundy, Tom Gye (the baby) and Ena Gye taking the part of the runaway husband. Nancy Merritt sits in the middle and the other sitters, from left to right are Keniel Poolman, Bessie Gye and Ellie Gye. We have looked at the Gyes and their cousin Eric James in the past, so let’s consider the friends this time. Winnie Mundy was an incomer. She had been born in Hatfield, Hertfordshire in 1907. Her parents, Arthur and Margaret (née Burgin) had married there the year before. But in 1911 the family were in Market Lavington where Arthur was a bricklayer. We think Ruth Mundy is little sister. Certainly Arthur and Margaret had another daughter in 1912 in the Devizes area so probably in Market Lavington. 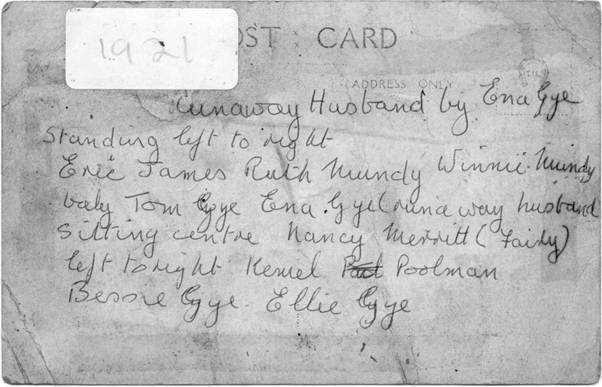 One letter of the record is difficult to read but the lass appears to have been named Sarah R I Mundy. So maybe she was known by Ruth – the R word. Unfortunately it is the R which is the blurred letter. We are less sure about Nancy Merritt. A girl with that name was born in Farnham in Hampshire in 1912 which could be the right age for the girl in the photo. But here was a large Merritt family who lived close to the Gyes. It seems likely that Nancy was one of them. Keniel Poolman was the child of Andrew and Rose (née Polden). He was registered as Jacob J K Poolman after his 1918 birth. We know that the Poolmans lived near the Gyes on White Street in Market Lavington. Not even Mrs Elisha was teaching at the school in 1921. But Miss Potter was and she became Mrs Elisha when she married Bill on 27th June 1929. Let’s take a peek at the picture. 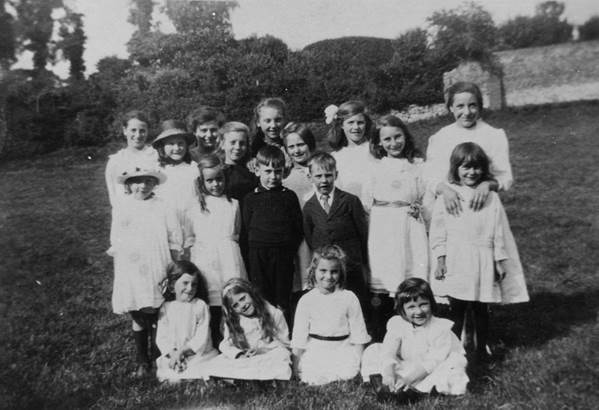 Miss Eleanor May Potter (always known as May) is at the back right and we can name a few others in the photo. Sadly, what name applies to which youngster is not clear. The back row has W Cooper, a young Miss Bullock, D Cooper, E Gye. There is said to be an unknown person next to Miss Potter. The next row forward has R Mundy at the left and a young Miss Still at the right with three unknowns in between. The next row has an unknown, L Potter, V Tucker an unknown and a young Miss Shephard. Seated at the front there are two unknowns then B Jordan and B Gye. Now that lists 20 people. There are 19 people in the photo. Just possibly someone out there can help us. It is thought that Miss Potter may have been taking the class on a picnic. The location is not known, but presumably it is well within walking distance of the school – now The Old School.